does not mature, becomes vunerable to frost. 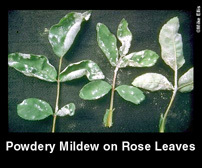 Cause: Powdery mildew is favored when rainfall is low or absent. Infection with powdery mildew spores from one-sided fertilizing, too little air circulation, and heat. Can also be caused by overcrowding and planting in the shade. Prevention: Choose a well-ventilated location, fertilize with low-nitrogen. In fall, prune back affected canes to healthy wood and destroy cuttings. In spring, prune bushes to provide circulation. Do not overfertilize. Depending upon growth, spray with fungicide ever 10 to 14 days.